The critically acclaimed and best-selling PlayStation 3 video game jumps onto the comic page, featuring an all-new action-packed story written by Joshua Williamson (SUPERMAN/BATMAN) with fantastic covers by the legendary Tony Harris. 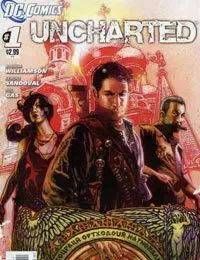 Its just in time for the highly anticipated Uncharted #3: Drakes Deception coming in November! A quest for the legendary Amber Room launches Nathan Drake on a journey to the center of the earth. As enemies from Sir Francis Drakes past come for revenge on his descendant, Drake must use all the skills at his disposal to stay one step ahead of the game!